The Economic Development Forum of Georgia, which was organized by the Ministry of Economics and Sustainable Development of Georgia, was held in Tbilisi on August 4 2016. The first Vice Prime Minister, Minister of Economics and Sustainable Development, Dimitri Kumsishvili, said that Georgia is one of the most progressive and successful countries in the field of reforms. “This is the first day of the Economic Forum, where we have invited famous economists Dani Rodrik from Harvard University and Charles Sabel from Columbia University in the City of New York to participate in the Forum. They shared their visions and ideas regarding the development of economic policies,” stated Kumsishvili. 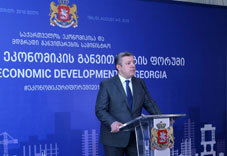 Prime Minister Giorgi Kvirikashvili stated that Georgia has defined 4 directions which are necessary for the country’s economic development. They are: changes in the education system, reforms in ethe conomic field, service-oriented state model and development and rapid infrastructural modernization of Tbilsi. "We have an opportunity to assess our reforms and plan future steps for fast economic growth. Georgia is a country of an open economy and is well-oriented towards regional economies,” stated PM. He underlined that there are no internationally recognized theories, and each country is in need of an economic growth policy that meets its demands. “Georgia is a country with an open economic system that is navigating quite well across the regional economies,” stressed Kvirikashvili. The Prime Minister also outlined the importance of amending capital market and reforming pension system that will be based on mandatory payments adding that the reforms will start next year. “This is a highly ambitious project and the concept has been elaborated. 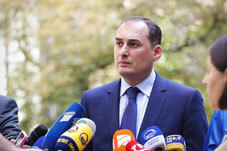 By the end of the year and in the beginning of next year we will start its implementation,” stressed Kvirikashvili.